Anglogold is a giant mining company with worldwide operations. The stock is listed on several exchanges including New York, Johannesburg, Ghanaian, London and Australian stock exchanges, as well as the Paris and Brussels bourses. Top labeled (1) at Q4 2003 followed by a year and a half A-B-C correction (wave 2 down) and a touch at the 200 weekly moving average (WMA). Anglo is currently in wave (3) up. The stock topped well before the gold indices, lost about 76.4% of the (i – 3) minor up wave progress and bounced from the 200 WMA. Indicators – RSI stagnant just below 50, PPO still bearish below zero. 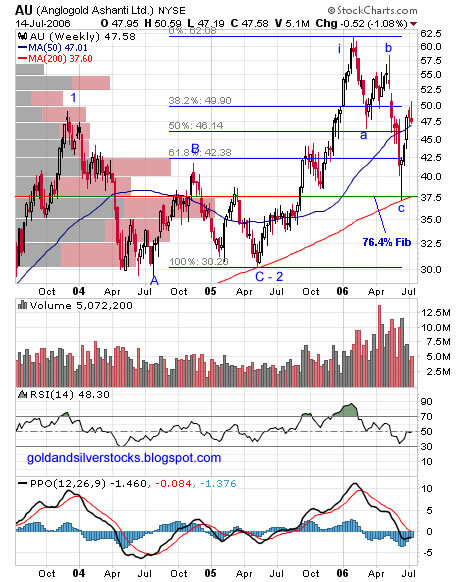 Support –Fibonacci lines below the current price. Resistance – at Fibonacci lines above the current price and the Q1-2006 top. Rallied strongly lately from extreme oversold condition, 50 / 200 bearish DMA crossover. Indicators – RSI trending down but still above 50, PPO above zero but seems to turn back down. 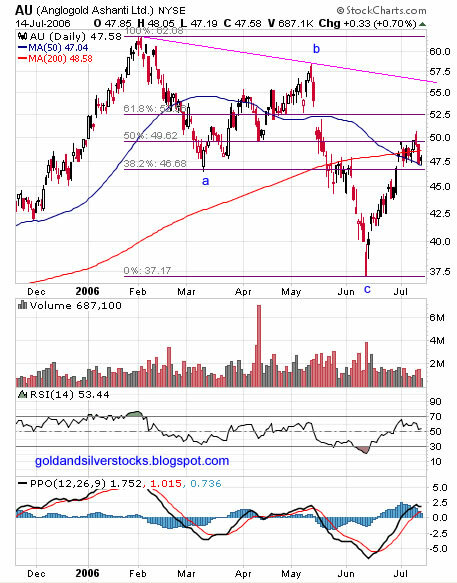 Resistance – at Fibonacci lines above the current price and the and the pink downtrend line.